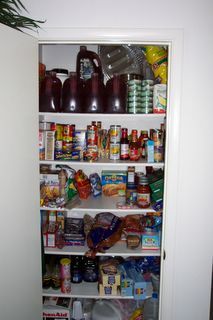 Rantings of An 80s Nut: Will The Real Pantry Please Open Up? I felt really bad about putting up a generic picture of the pantry because... I'm jut not that organized. This is how it really looks and yes there are tons of things that I didn't list and at some point I'll organize it better. The fascade is lifted. Is that Ramen Noodles or cat food towards the bottom there? If it's on the same shelf as the 20 bottles of Mike's Hard Lemonade and grape juice bottles, it it probably oatmeal boxes. To the right of that is the Red Vines stash. I'm a fan of Mike's Hard Lemonade especially during the summer months, don't like his hard ice tea though. I actually tried out the Hard Ice Tea and thought of many other drinks that turned my stomach that I'd rather drink. It does remind me that I have to start going through the Hard Lemonade. I don't think that stuff stays fresh as long as I'd prefer.